It is always hard to find new places to talk about in the Napa area. I mean, even though there are lots and lots of restaurants to choose from, we try to seek out the hidden gems for you. 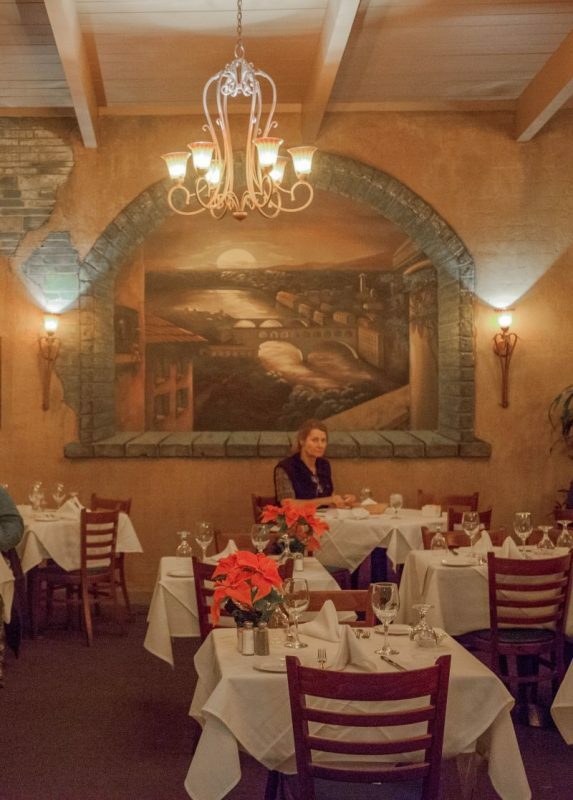 Ristorante La Strada is located on the very edge of Napa; towards American Canyon. When we looked, they didn’t seem to have much of a web presence, and their website didn’t work. However, it did get good reviews on Yelp, so we thought we’d give it a try. The website seems to work now. I had seen La Strada many times as I passed. It doesn’t look much from the outside, but looks are deceiving in this case. 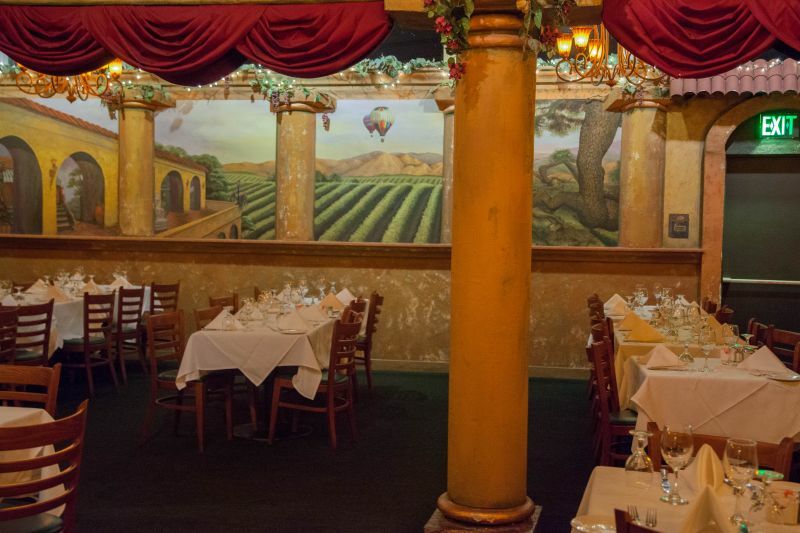 The inside of the restaurant is almost overly done in Italian style; including frescos on all the walls, chandeliers, Romanesque style columns, and dim lighting. Still, we all liked it and were impressed with the space. It is a way larger restaurant than it looks from the outside. We were a group of five diners on this excursion. It is always more fun to blog with friends as we get to experience more of the dishes that are prepared by the restaurant. We were greeted by a very personable and knowledgeable waiter who helped us go through the menu and answered our millions of questions. He gave us great service all through the meal. Waters, drinks, and bread were all delivered very quickly. 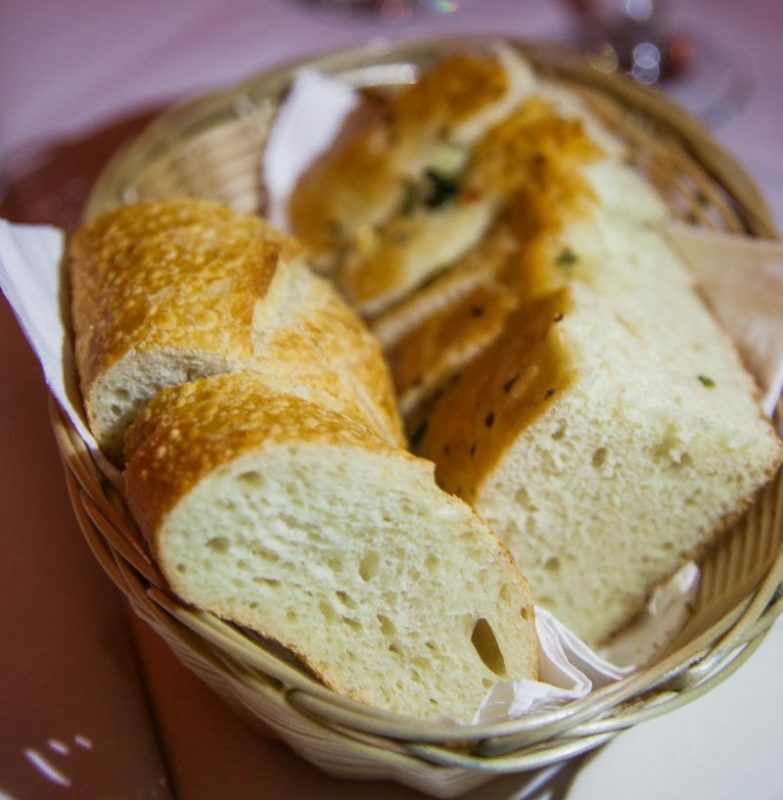 In the bread basket was foccacia and Italian slices served with a garlic infused olive oil dipping sauce. It was delicious and none of us had to worry about vampire attacks afterwards. I’d call that a win. The Brit comments: I think that the dipping sauce was garlic lightly infused with olive oil; the garlic was so intense. We started off ordering the Antipasto plate. Thank goodness we were sharing it between us, because it was huge. 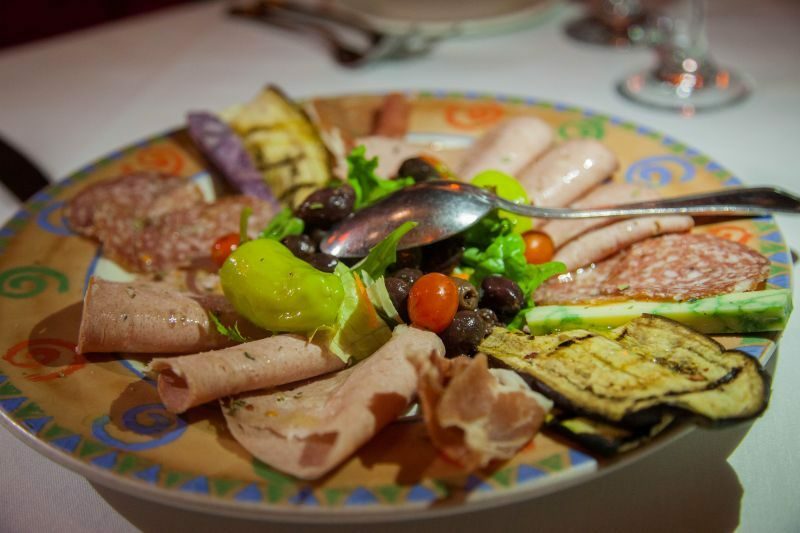 There were plenty of olives, sliced meats, grilled veggies and garnishes on the big platter so that no one was left feeling like they didn’t get enough. We ordered a good mix of main courses, and all made an effort to be different. 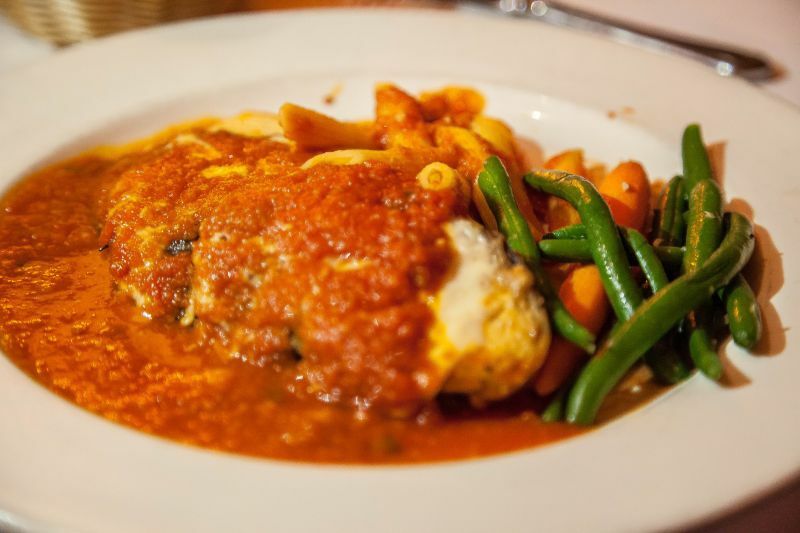 I ordered seafood linguini, The Brit ordered veal scalopini, my mom ordered eggplant Parmesan, one of our guests ordered pork osso bucco, and our other guest ordered chicken Parmesan. 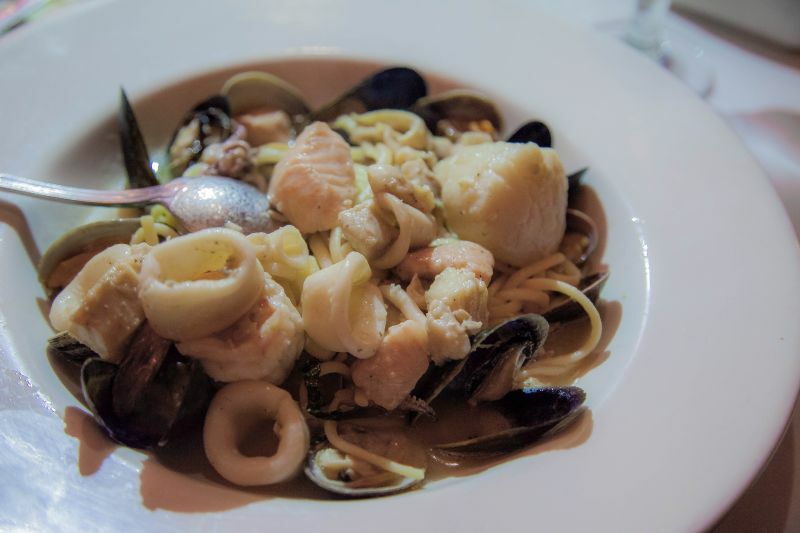 My seafood linguini was a very good representation of the dish. The linguini was cooked perfectly and the white wine sauce had no cream, but was full of flavor. There was tons of seafood in it; baby squid, calamari rings, salmon, shrimp, muscles, and scallops. My only disappointment in my dish was the calamari rings were overcooked and rubbery. The rest of it was cooked beautifully and I enjoyed my plate. 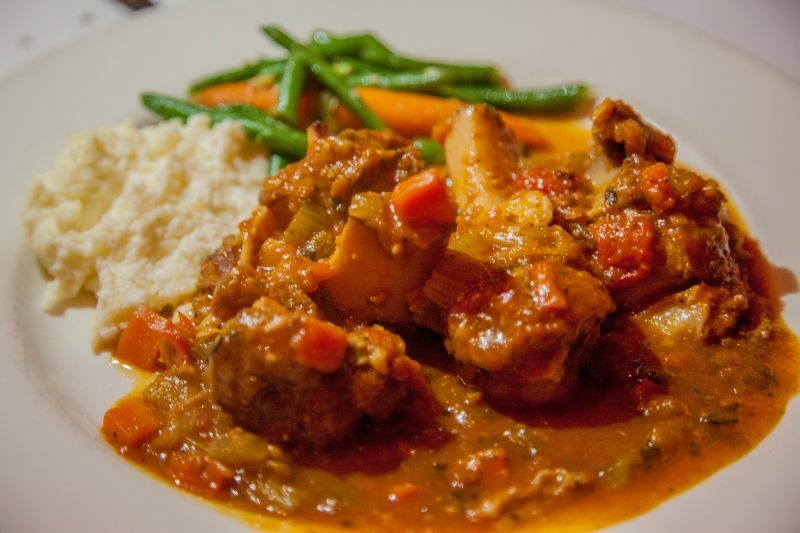 The pork osso bucco was a plentiful plate. It was served with polenta. I had a bite and the meat was cooked beautifully, but there was what seemed to be an overwhelming lemon flavor to the dish, which seemed out of place. I liked it, but the plate’s owner and I agreed that it wasn’t something either of us would order again. The eggplant Parmesan was nicely presented. Bright red colored marinara covered the plate. It had really good flavor and texture. We all agreed that this was one of our favorite plates of the night. The chicken Parmesan too was covered in the marinara. I didn’t really care for this dish, as the chicken coating was mushy rather than crispy. Sadly, it was just a meh for me. The good quality of the marinara sauce couldn’t save it. The Brit’s veal was delicious. Tender, and beautifully cooked, this dish had great flavor. He substituted his polenta with garlic fries. The Brit comments: There were several veal dishes on the menu, but I this was one of the specials of the day. I ordered it based on a recommendation from our waiter. 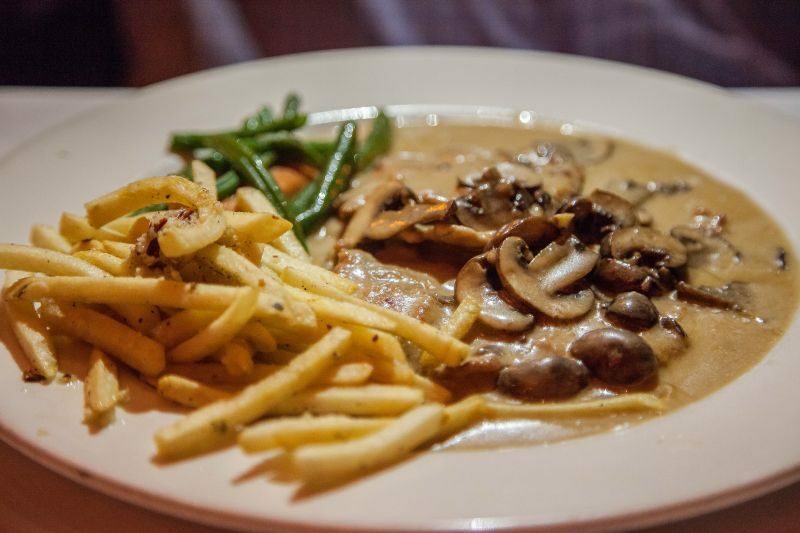 It was severed in a Champagne sauce with sliced mushrooms; tasty and tender. The garlic fries were strongly favoured, even after the garlic in the bread dipping sauce. For dessert, we ordered three different dishes to share between us five people. The chocolate ganache cake, affogatto, and crepes. The Brit is all about ice cream in any form for dessert. He hogged the affogatto at his end of the table, and people only got one little taste. 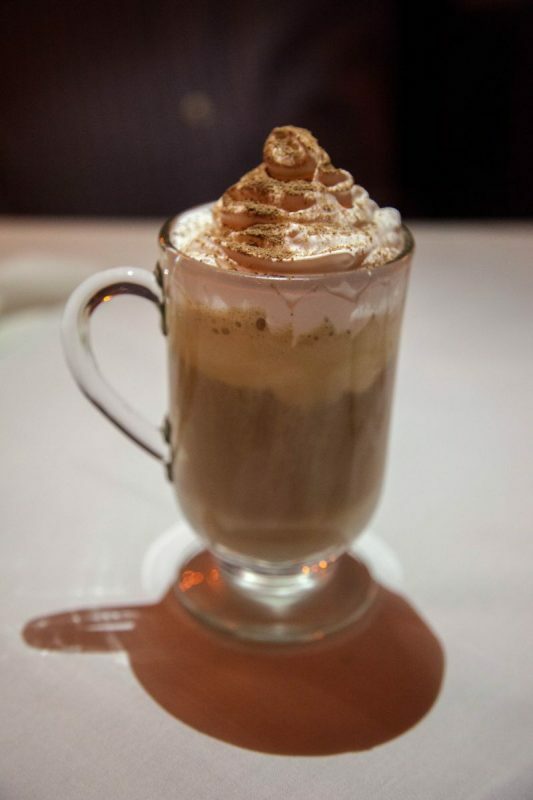 The Brit comments: The affogatto was more of a cold coffee drink than a traditional shot of espresso tipped over the ice-cream. It was, however, delicious, but came a distant second to the crepes. 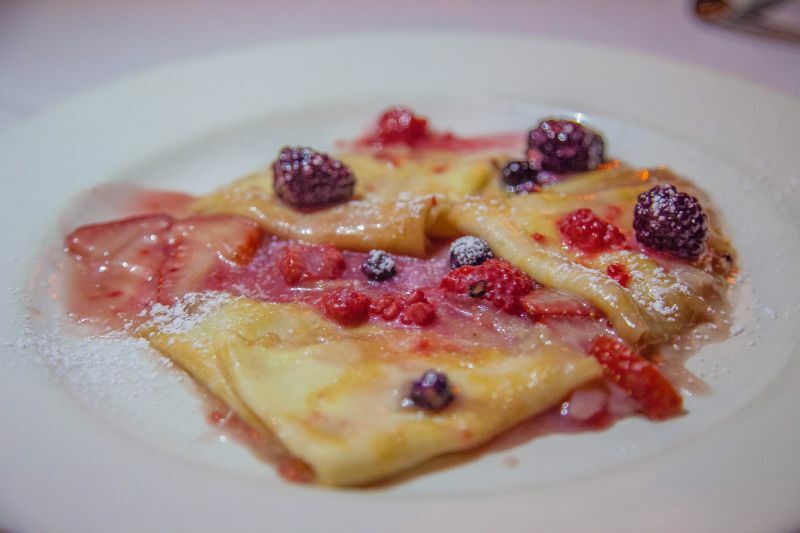 All of us agreed that the crepe was the winning dessert. It had stewed berries and was finished off in a sweet Grand Marnier sauce. It was delicious! The last dessert was just OK. 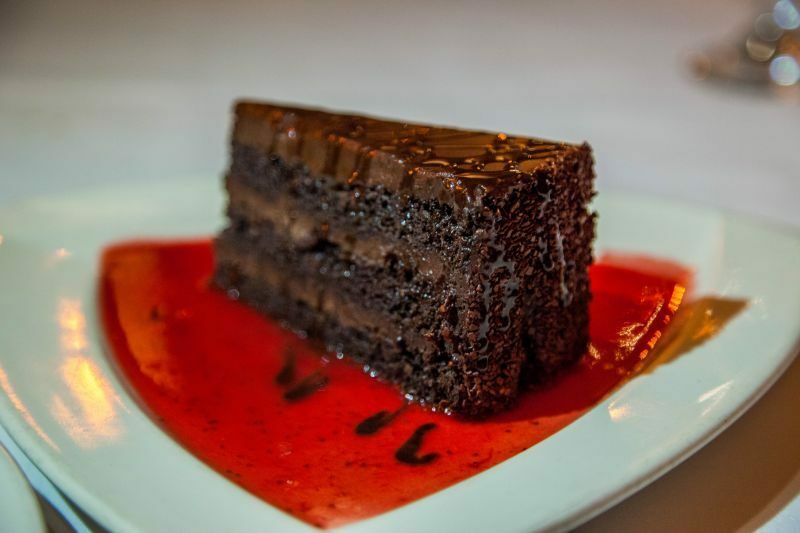 It was a deep, dark chocolate cake served on a pool of strawberry sauce. Now, normally this would really excite me, but the flavor and texture of the cake weren’t that good. This just got a meh from me and one of our guests, while my mother and other guest liked it. The Brit was too busy hogging up the ice cream Affogato to taste it. When the bill came it was a reasonable $38 per person. I thought that was extremely good value considering all the food we got. The Brit comments: That $38 included the tip we added, so excellent value. Their wine list, although simple is notable for being excellent value; a bottle of Napa Mumm for example is priced at $34. 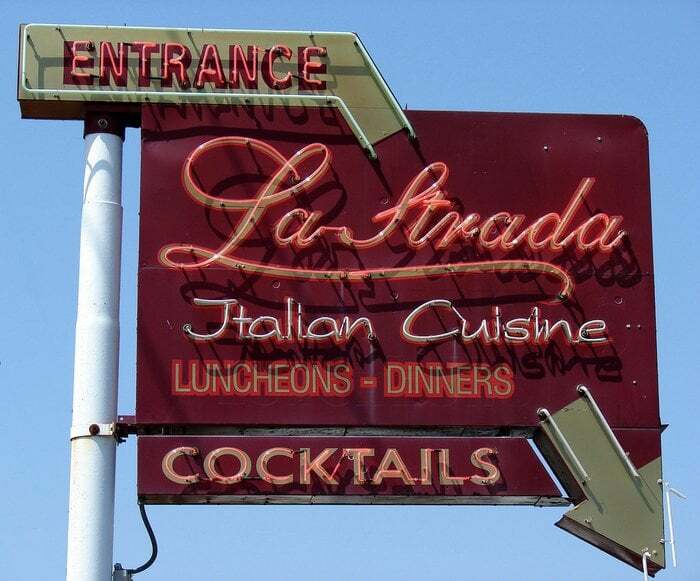 All in all I’d give La Strada a good, but not outstanding rating. 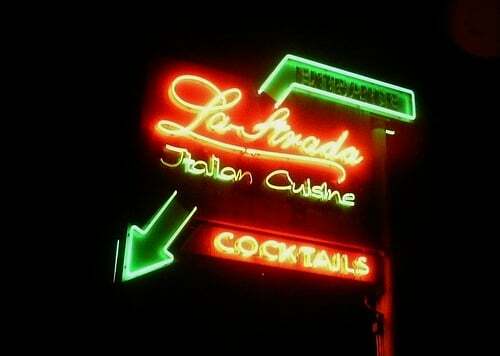 I thought the food was worth eating, and the service and ambiance was really nice. We really enjoyed our night out there. I think the four stars on yelp were pretty much right on the money.